Find out more information on the city's parking rates, parking lot and garage locations, and frequently asked questions. The City of Riverside provides 1,016 on street, metered parking spaces servicing downtown. ParkRiverside, managed by Republic Parking, is charged with promoting and maximizing parking opportunities that contribute to improving the quality of life in the City of Riverside’s residential and commercial areas. Republic Parking’s staff operates and manages the city’s parking facilities, and the installation, collection and maintenance of the parking meters. The City of Riverside Parking Services Division is responsible for on street parking enforcement and citation management. If you have a question about citations please visit the City of Riverside Citation information web page. 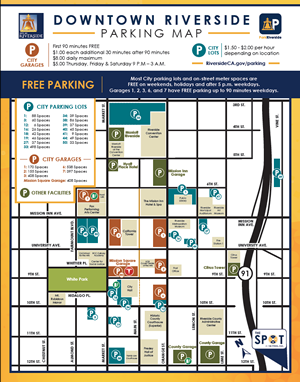 Parking in downtown Riverside during normal business hours is controlled by time limits and paid parking services such as curbside meters and City-managed lots and garages. Before leaving your car, check the posted signs for time limit information. Garages – After 5 P.M. Monday – Wednesday, 5 P.M. – 9 P.M. Thursday – Saturday. (You must enter garage after 5:00 P.M. and before 9 P.M.), Sundays all days. Lots and meters after 5 P.M every day. $5.00 Thursday, Friday & Saturday 9 P.M – 3 A.M. Monthly Parking is available at select locations. Curbside metered parking is available throughout Downtown Riverside. Meter Times: Monday through Friday 9:00 A.M. – 5:00 P.M.
Find Riverside parking near some of the city’s most popular destinations below. When Republic Parking was founded over 50 years ago, its humble staff of one achieved first-year revenues of $50,000. Today, Republic Parking is best known as the leading provider of municipal parking solutions in the United States. We proudly provide jobs to over 2,800 professionals in 100+ U.S. cities and generate annual revenue in excess of $480 million. We unequivocally credit this success to serving clients honestly, eagerly, and professionally.